▶ SoldThis listing was sold on Jan 2, 2018 for the price shown here. ***PRICE REDUCTION*** Welcome to Ventana Lofts. 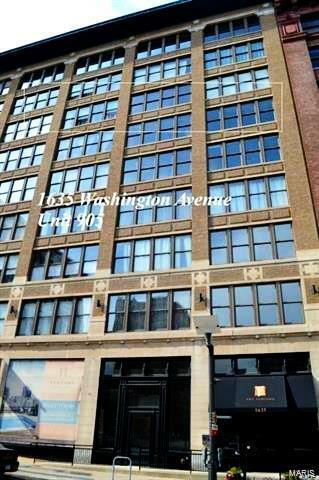 Right on Washington Avenue, this top floor 2 BR 1 BA loft offers great location, rooftop splash pool with community room, assigned parking in the underground garage and a storage locker. The spacious master suite with separate tub and shower meet your every need. Granite counter tops give that updated look. Kitchen/living area is perfect for entertaining or showing off your culinary skills while watching TV. Upper floor views of the city looking south show off the amazing architecture of St. Louis. The 2nd bedroom allows several options - a study, office, game room, or bedroom. Let your mind wander. Be creative. Entertain family/friends in the community room or relax by the splash pool while taking in the city skyline and Arch. This unit is market priced for a quick move in if approved. With so few good rentals right now, why wait. Just ask yourself, will it be available tomorrow. Don't be left out! Call to schedule your viewing today. Washington Avenue to 1635. Park on street at meters 8:00 AM - 7:00 PM Mon-Sat. Sundays and holidays are FREE unless otherwise posted. Roof-Top Community Room Is OPEN...!!! Fireplace & Flat Screen TV & Lounge Seating --- Ready For Game Day!! !